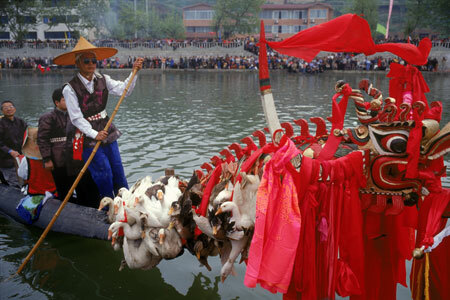 A dragon boat is getting ready for the big race during the ?Sisters Festival?. Generally, each boat represents a village - it is the pride of the village. Each year in southeast GuiZhou, Miao people traditionally have almost as many festivals and celebrations as the number of weeks in a year. Indeed the Miao are a very joyful people.